The most advanced PS/2 hardware key logger available on the market, with up to 8 gigabytes of internal flash memory! This hardware keylogger features a text menu with loads of options for analyzing recorded data. Additionally, the USB Download Accelerator is included for super-fast retrieving of logged data. 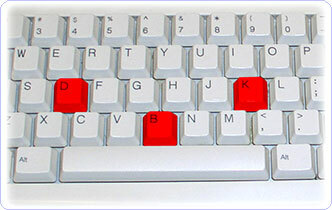 The keystroke logger is completely transparent to computer operation, no software or drivers are required. Supports national keyboard layouts. Retrieve entire log in seconds! Advanced text menu for viewing recorded data, includes Net Detective, Phrase Search, Key Filtering, Unplug Counter and more! Multi-language menu: English, German, Spanish, and French! 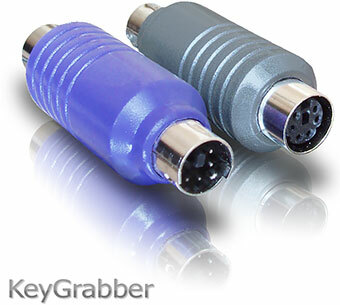 Please contact us with enquiries regarding the KeyGrabber PS/2. Thank you. 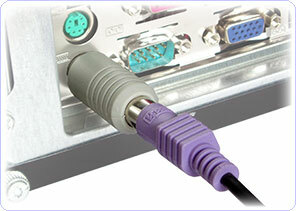 Installation of the hardware PS/2 keylogger in record mode is quick and easy. 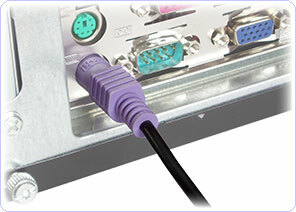 Simply plug it in between the PS/2 keyboard and the PS/2 keyboard port. No software of drivers are required. The hardware keylogger will automatically start recording all data typed on the keyboard to the internal flash disk. Disconnect your PS/2 keyboard from the PS/2 port. Connect the PS/2 hardware keylogger between the keyboard and the PS/2 keyboard port. Once data has been captured, you can retrieve it on any other computer by invoking a text-menu. The PS/2 hardware keylogger and keyboard should be connected in the same way, as in record mode. Open any text editor, such as Notepad or MS Word. Each device has a built-in 3-key combination (by default K, B, D). Press these 3 magic keys simultaneously to trigger the text-menu. Use the digit keys to surf around the menu. For example, pressing '1' initiates memory viewing. The text-menu offers a variety of view, search, and configuration options. Examples of text menu usage are shown below. More details are available in the KeyGrabber PS/2 User Guide. 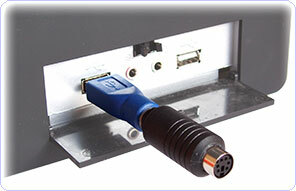 The included USB Download Accelerator provides an alternative data retrieve method to the text-menu. The USB Download Accelerator allows super-fast retrieve of the entire data log file via USB. Connect the keylogger to any free USB port, using the provided USB Download Accelerator. The logger will automatically respond as a mass storage device. The Flash Drive will contain the file LOG.TXT with a text log of all data captured in record mode. Copying this file to your hard drive will take a few seconds. The LOG.TXT file may be later viewed and searched with any text editor, such as Notepad. It is possible to enable a national layout for language-adapted keyboards, such as French, German etc. This will allow national characters to get logged properly (including those with Alt Gr), such as ö, ß, ó etc. The following example demonstrates the advantages of applying the German national layout. To enable a national layout, the appropriate layout file named LAYOUT.USB must be placed in the hardware keylogger root folder. The file must be copied in Flash Drive mode (no access to the flash disk in record mode). Layout files may be obtained from the CD-ROM attached with the device or from the download section. The flash disks main folder should contain the file LAYOUT.USB and the standard log file LOG.TXT. To enable the layout, safely remove the flash disk. On record mode initiation, the layout file will be loaded automatically.